We compiled them from a number of use cases our customers have shared with us. It has been a really rewarding experience to get the feedback from network engineers on how they use our product. With NetBeez, our customers have reduced dispatches by being able to know exactly what’s going on at every remote site of their network, decreased troubleshooting time thanks to the fault-isolation data displayed on the dashboard, and proactively detected and repaired network issues at remote locations even before their users got impacted and opened tickets. 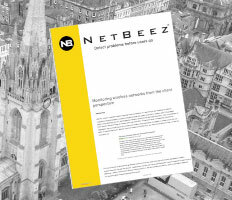 This document demonstrates how NetBeez, with distributed end-user monitoring, puts the real-user network experience at the network engineer’s fingertips. In addition to Troubleshooting with NetBeez, you can also download Introduction to NetBeez for a more formal introduction to our tool. If you want to learn how NetBeez works, feel free to sign up for a demo.